Designed for use in cyclone prone areas, Cyclonic Gable Homeshed Garages are built to withstand extreme weather conditions. Featuring an attractive and practical pitched roof and available in a range of sizes and colours. More than just a timeless design, a pitched garage roof minimises heat build-up, increases storage space on the inside, and delivers the benefits of a self-cleaning shape on the outside. The frame of a Gable Homeshed Garage is constructed using strong, galvanised C-section beams. Hi-tensile bolted eaves and ridge connection brackets provide a seamless portal frame structure and are engineered to provide additional torsional strength. The garage roof is clad with traditional corrugated steel in double sided colour and comes standard with gutters and downpipes. 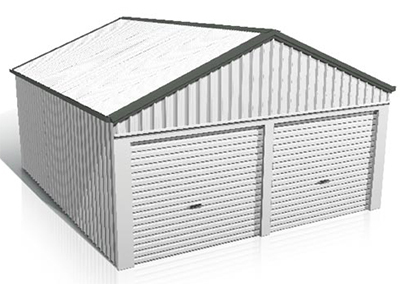 The sheds double sided colour walls feature Superdek® sheeting which is a durable and hard-wearing sheet due to the 28mm high ribs in its profile. The sheeting on the gable wall for standard Domestic width garages is pre-cut to fit the gable shape for easy installation. Gable Homeshed Garages are available in two categories; Domestic garages up to 6.9 metres wide, and Large Span garages from 6.9 to 15.4 metres wide that range from two bays, up to an endless number of extra bays. Check the dimensions tab for details. 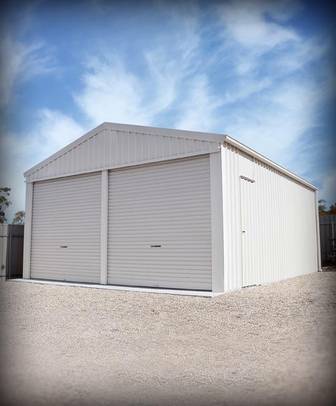 Domestic garages feature 18 sizes, based on two single size widths and three double size widths. There are three heights of 2400mm, 2700mm and 3000mm to choose from. Large span garages feature 11 standard widths and 11 standard lengths which are available in two different garage bay sizes of 3050mm and 3810mm. Two additional wall height options of 3600mm and 4200mm are available for higher door clearances. Non-standard options include; widths up to 15350mm, endless non-standard length options, heights up to 4200mm, and 5000m bay options for a wider door opening are available on request. Gable Homeshed Garages are available in a wide range of colours. Select either sliding garage doors (Domestic range only) or roller doors. If the side of the storage shed is to be built on a boundary, internal box gutters can be ordered. Optional extras include windows, skylights and a personal access door. Roller doors can be fitted with remote controlled garage door openers and the garage walls can be ordered in a corrugated profile for a different appearance. Gable Homeshed Garages have been independently assessed to meet all relevant Australian Building Standards. This gives you the confidence that a Stratco Garage will stand the test of time. Domestic Gable Garages are designed to suit wind speed areas N1 (W28), N2 (W33) and N3 (W41). Large Span Garages are designed to suit Region A, terrain category 2 and 3, Region B, terrain category 2 and 3 and sub-alpine regions. For cyclonic rated garages visit Cyclonic Gable Garages. With easy to follow installation instructions and featuring pre-punched and pre-cut framework and steel sheets for a simple construction, Gable Homeshed Garages are the ideal do-it-yourself project. We can also complete the job for you. With a simple wash and wipe using a soft broom, your Stratco Gable Garage will maintain its great looks for even longer. Produced from the highest quality materials, you can expect many years of service from your garage if the recommendations in the ‘Selection Use and Maintenance Brochure’ are followed. Sliding door or a roller door in the Domestic range. Remote controlled roller door openers.